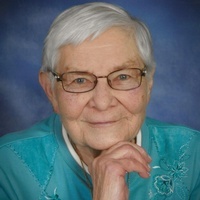 Gladys Hallstrom, 87, passed away on Wednesday, March 27, 2019 at Sanford Hospital, Thief River Falls, MN. 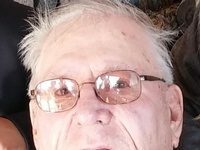 Funeral service will be Saturday, April 6, 2019, 10:30 am with visitation one hour prior to the service at Zion Lutheran Church in Thief River Falls, MN. Rev. John Golv and Rev. Ale Tulu will officiate. Burial will follow at Greenwood Cemetery in Thief River Falls, MN. Visitation will be held Friday, April 5, 2019, 5-7pm with a prayer service at 6:30 pm at Zion Lutheran Church in Thief River Falls, MN. Visitation will also be held Saturday, 9:30-10:30 AM at Zion Lutheran Church. Gladys Hilma Irene Vigen was born July 11, 1931 to Edward and Martha (Moe) Vigen in Thief River Falls. Pastor Dahle of St. Pauli Church baptized her on July 20th. At the age of 3, her family transferred to Zion Lutheran Church where she was confirmed in 1945 and active in Luther League and Bible Camp. She attended Knox Elementary School and Lincoln Junior/Senior High School, graduating in 1949. She kept house for her brother, Bert, on the farm for 2 yrs. and then attended Augsburg College in Minneapolis. Gladys married Wilbur Alfred Hallstrom, June 27, 1953 at Zion. They lived on the Hallstrom family farm (listed as a Century Farm in 1992). To this union four children were born: Gregory Alfred, Anita Mae, Marya Louise and Daniel Edward. Wilbur died November 2, 1994. Gladys was an active member at Zion where she served on the Worship Board, sang in the choir, was secretary of the church council, taught Sunday School and Vacation Bible School, was active in ZLCW circles as well as President, Secretary, Education Secretary of the LCW and a term as Secretary for the Conference LCW. She also helped organize Leisure Fellowship in the early ‘70’s. 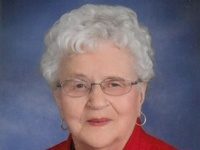 She was an active 4-H member for 10 years and an adult leader for 12 years being recognized for her service with the Pennington County 4-H Alumni award and was a member of the 4-H Hall of Fame. Gladys was a stay at home Mom until 1970 when she went to work with the Minnesota Crop Reporting Service for 3 years, then 6 years as the baker at Lon’s Restaurant, next as a Demo person for Piggly Wiggly in 1978 and later at Hugo’s when they opened in 1988 – working mainly for Cass Clay Creamery and, finally (before retiring), 3 ½ years for Jane Mattson Catering – being in charge of the ground floor lunchroom at Digi Key. She was active with Wilbur in the operation of the farm – especially with their registered Milking Shorthorn cattle (her part was the calves-naming them and feeding them). They were active in the Milking Shorthorn Assn. at the local, district, state and national levels – serving as Secretary for the state association for 12 years. She was named Farm Woman of the Year for Pennington County in 1985 and received the Farmer/Homemaker award together with Wilbur in 1990 from the Red River Valley Winter Shows. 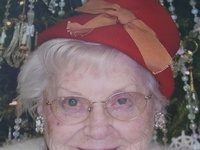 She was also active in Homemakers; served as President of the Home Council; served on the Board of Directors for American Cancer Society; Board of Directors for Area Ag Center; Treasurer of Black River Township; Election Judge; and worked with Minnesota Make It With Wool Assn. on the local, district and state level (chaperoning one state winner to the National Convention in Oregon). Gladys was appointed director from Pennington County on the Red River Valley Development Assoc. in 1994 and was also appointed on the local Extension Committee in 1996 (retiring from both of these positions in recent years). In 2014 Gladys sold the family farm to her son, Greg, and moved into Thief River Falls – first to Skylite Apartments and most recently residing at Oakland Park Communities. She is survived by 4 children: Gregory (special friend, Katherine Duray), Thief River Falls, MN; Anita (Mark) Udager, North Oaks, MN; Marya (Greg) Leach, Sioux Falls, SD and Daniel, Owasso, OK plus 9 grandchildren: Heather (Joe) Bregier, St. Hilaire, MN; Michael (Stephanie) Hallstrom, Boise, ID; Bryce Hallstrom with the US Air Force; Andrea (Scott) Collins, Blaine, MN; Aaron (Kara) Udager, Ann Arbor, MI; Matthew (fiancé, Stacey Pritchard) Leach, Minneapolis, MN; Kelli (Lee) Nori, Rockwall, TX; Krista (special friend, Paul Hawkins) Leach, Stillwater, MN; and Kaila (Dave) DiNallo, Wyoming, MI also 13 great grandchildren: Evan and Lilly Bregier; Annaleigh, Charlotte, Ellsa and Harald Collins; Alex, Ryan and Johanna Udager; Elyse Leach; Audette Nori; Tyler and Corie DiNallo as well as many nieces, nephews and cousins. Gladys was preceded in death by husband Wilbur; parents; infant brother and sister; brothers: Oscar, Bert and Melvin Vigen; sister-in-laws: Lois Vigen, Jolyn Vigen, and Marge Vigen; and nieces: Jennifer, Angela and Diana Vigen. In Lieu of flowers please give to Zion Lutheran Faith Fund.